Ah the KREATOR has returned! One of my all-time favorites has returned with their 13th studio album and man does it ever rip! ‘Phantom Antichrist’ continues on the path that was started with 2001’s’ Violent Revolution’ and continued through’ Enemy Of God’ and 2008’s ‘Hordes of Chaos’. While ‘Enemy of God’ was a brutal powerhouse of near perfection in my opinion, I felt that ‘Hordes of Chaos’ took a small step backwards. Although a very good album in itself, I felt that the added melodies and twin guitar work took away from the brutality brought out on the two previous albums. The rhythms of the songs were at times distracting from the energy of the songs and the melodic parts didn’t quite meld well. So I was curious to hear which direction they would take on the next album. Bring back the pounding rhythms of ‘Enemy’, or continue with the melodic style of ‘Hordes’. The Answer is both. ‘Phantom Antichrist’ roars out of the gates and never lets up. The melodies are brought out more than ever but they work perfectly with the songs. The songs are epic and downright brutal. Every single riff is top notch and catchy. No filler! Sam Sirnio rips out mind blowing solos that are written in a Judas Priest style with a few steroids thrown in. The songs never lack energy or get confusing. There are a couple slow acoustic breaks that give you just enough time to take in the devastation around you before ripping you back in for more. Mille Petrozza sounds just as pissed as ever if not more so, and can still melt the wire around the microphone. The lyrics are very thoughtful, vivid and straight pissed off. From the title track that takes a stab at creating an imaginary villain to justify war, to the straight angry ‘Death to the World’, and the uniting anthemic shouts of ‘From Flood into Fire’ you always feel like there is deep passion to every word yelled. Mille has always seemed to have a certain vision for the band and with this album it seems he has accomplished his goal. Not that he will let up any time soon. 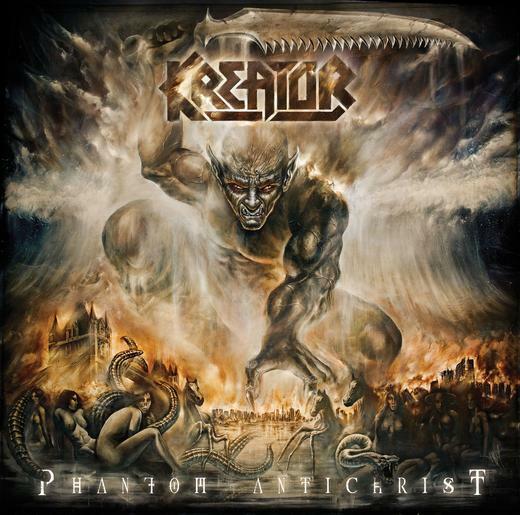 While many of the modern albums released from veteran thrash bands borderline on the groove rock/ borderline pop metal sound its safe to say that KREATOR still writes thrash music. They have progressed with a relentless commitment to quality and could easily hold their own against any metal band. It’s been a while since I’ve been this impressed with an album and can’t recommend it enough. Even if you’re scared of melody give it a try. It rules. ~ by thrashpunx on June 9, 2012.